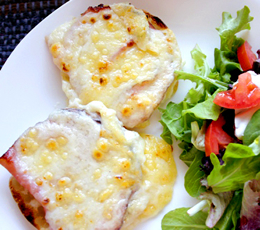 Croque-Monsieur, FOR SURE! Try this French recipe brought to you by Teenytinykitchen.com! It’s quick, it’s easy, and it’s delicious. Lightly toast the english muffins until just brown. In a small saucepan melt the butter and then add the flour. Stir well for 1 minute. Add the milk, bay leaf, dijon and pepper then bring to a simmer. Stir constantly until the sauce has thickened, about 3 minutes. Remove from heat. Lay the english muffins face up in a baking dish. Layer the ham on the muffins and spoon about a quarter cup of the sauce on each. Divide the cheese between the muffins. Broil until brown, about 3 minutes.